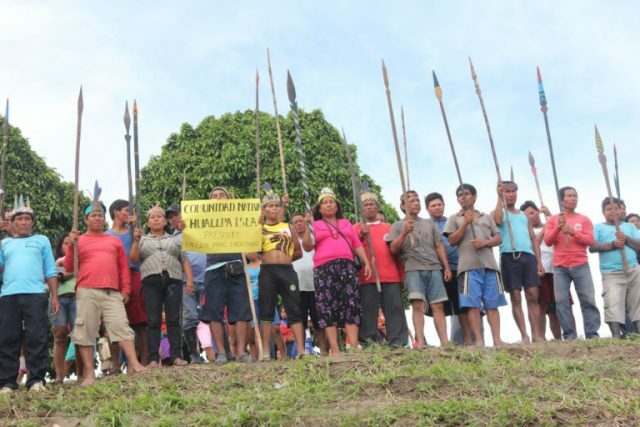 An indigenous protest over oil pollution in the Peruvian Amazon — which is blocking boat traffic on the Marañón River, a crucial transportation route — could move toward a solution in the coming days, with a meeting between protesters and Cabinet ministers. But in a November 3 letter, Fernando Zavala, who heads the Cabinet, made lifting the river blockade a condition for the meeting. Photos posted by protesters on social media show river boats and barges moored along the riverbank, unable to go upriver or down. The government delegation could include the ministers of justice, culture and health, according to a November 6 letter to the protest leaders from Rolando Luque, who heads the government office that deals with social conflicts. Leaders of the communities involved in the protest were meeting November 6 and 7 to discuss the proposal. The flurry of correspondence between the protesters and government officials followed an initial negotiating sessionOctober 11 and 12 in the village of Saramurillo, on the bank of the Marañón. A state of emergency declared for two districts in Loreto, the region most affected by the pollution and the protests, fell short of the protesters’ demands. The regional official in charge of civil defense said the government’s ability to respond was hampered by the river blockade. Pastor Dahua, president of the community of Monterrico, dips a stick into oil from a pipeline spill reported on September 25. Photo © Barbara Fraser. Indigenous leaders have insisted on meeting with Peruvian President Pedro Pablo Kuczynski or some of his Cabinet ministers, arguing that lower-level officials lack the authority to make binding decisions. “We’re tired of endless discussions,” said José Fachín, 35, a Kichwa law student who serves as adviser to the leaders of the five indigenous organizations heading the protest. During the October talks, the protesters demanded that a state of emergency be declared in the districts of Urarinas and Parinari, where a series of oil spills have occurred since 2014 along a crude pipeline operated by the state-run oil company Petroperú. But the emergency decree issued on October 29 covered only nine communities downstream from spills that occurred in the community of Nueva Alianza on August 19 and October 22. Those communities will receive drinking water and food assistance for 10 days, according to Alfredo Carrasco, director of national defense for the Loreto regional government. It does not include either Nueva Alianza or Monterrico, two communities where spills occurred. Nor does it include 6 de Julio or Naranjal, in the district of Lagunas, where spills occurred after the October meeting. Officials from the regional health, agriculture, environment, and civil defense offices planned to travel to Nueva Alianza on November 3 to assess further needs, but the trip was suspended because of the river blockade, Carrasco said. The state of emergency came after an exchange of letters between government officials and the protesters following the October meeting. On October 21, the government responded to the seven-point agenda that the indigenous organizations had presented during the talks. Those demands include repair or replacement of the aging Petroperú pipeline, remediation of polluted sites and compensation for the affected communities, an environmental monitoring law, and a “truth commission” to study the impacts of decades of poorly regulated oil operations that have left more than 1,000 polluted sites in indigenous territories in five watersheds. The protesters also called for a review of the contract with Argentinian-based Pluspetrol, which continues to operate the oil field known as Block 8. When Pluspetrol’s lease expired in the block formerly known as 1AB, now Block 192, the company pulled out in 2015 without remediating polluted sites in the Pastaza, Corrientes, and Tigre watersheds. Communities located in Block 8, which overlaps the Corrientes and Chambira rivers, fear it could do the same when its lease there expires. The indigenous leaders received a 10-page response summarizing the positions of various government agencies, without specific plans. They replied on October 25 with a three-page letter signed by at least 30 community presidents, in which they criticized “the limited action and attention to the underlying problems” in the communities. Indigenous protesters stand guard along the riverbank in the community of Saramurillo, in Peru’s lower Marañón River Valley. Photo © Barbara Fraser.